I have 3 sisters and 1 brother. Growing up, we were the "unusually large" family that people stared at. From left to right, Bobo (Debbie), Lele (Leah), Stephen (nickname varies according to mood-- hehe, j/k! ), Marsha (no fun nickname, although I was called Nerd and Dragonlady a few times), and Coco (Christine). 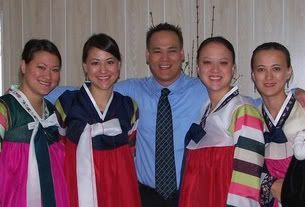 This was taken at my mom's 60th b-day party... hence the Korean dresses. It's not what you would normally find me wearing to Target or Kroger or something. And is it just me or do I look prego in that dress?! Agh!